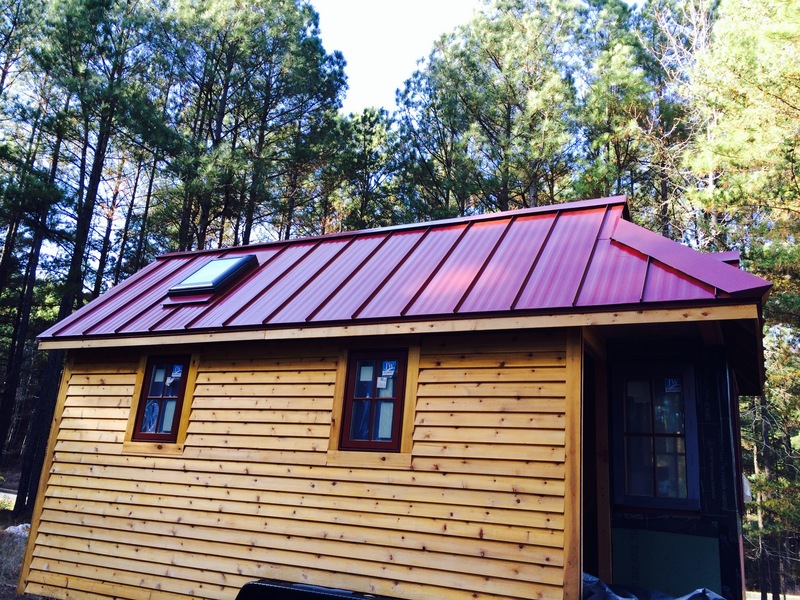 This is a guest post from Ryan Mitchell who blogs at TheTinyLife.com about tiny houses. I know many of you, myself included, have talked on the forums about building one, but here’s someone who actually build one! It started one Friday afternoon, my coworkers and I stood on the sidewalk outside our old office with the contents of our desks now residing in a cardboard box; the whole company had just been laid off and a million things were swirling around in our heads. How will I pay my bills? Rent is due next week! How am I going to find a job in a down economy? Luckily I was able find a job quickly, but that feeling never left me. I began to look at how I approached life, my relationship with money, what was important to me and how I could make sure that I never had to worry again. After taking a critical look at my spending I realized that most of my income went to housing, at the time, a whopping 50%! It was then and there that I decided that I had to figure out how to eliminate that line item and reclaim that half of my paycheck. I began exploring options to address this and stumbled upon the concept of tiny houses. Tiny houses are small homes that typically range between 100 and 400 square feet for a single person. They focus on design, effective use of space and simplified living. Most often they are built on a trailer to allow you to move them around easily and skirt building codes. One of the most appealing aspects is that you can build one of these for much less than a traditional house and in a very short time, you can own a tiny house with no debt. Tiny houses range in cost anywhere from a few thousand if you scrounge most of your materials to $50,000 if you have someone build it for you. Most people opt to build it themselves, even if they have never built anything in their lives. 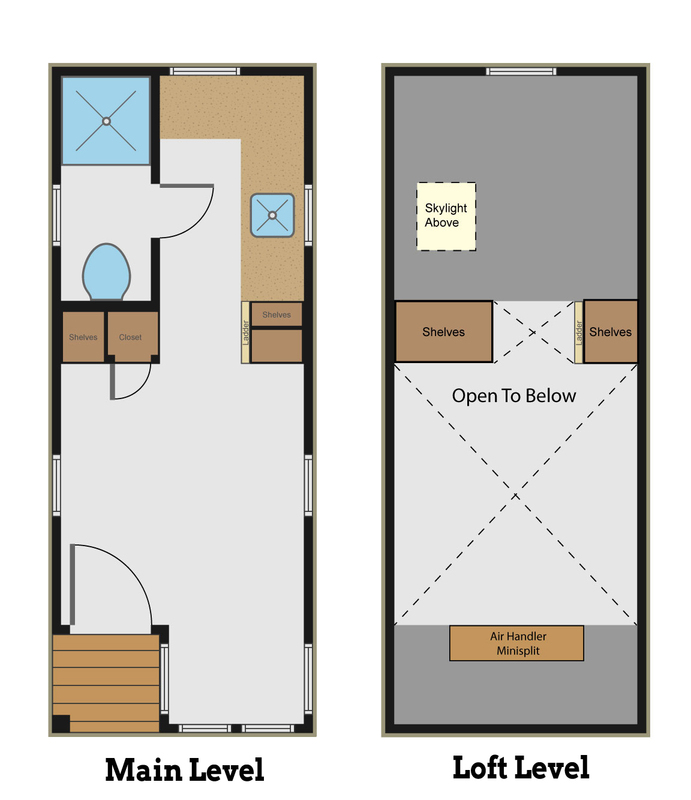 The scale of a tiny house is pretty manageable for anyone who is willing to work hard at it. For my tiny house I have opted to build it myself. Having no experience building, it has been a major learning experience, but I wouldn’t trade it for anything. In the end it will cost me the equivalent of 2 years rent, but I walk away with a house that I can live in for the rest of my life at next to no cost. More importantly it allowed me to never have to worry about where I was going to live and I now can reclaim that half of my paycheck. I knew going into this that my financial situation was going to change drastically, but now that I am a mere month away from moving into my house I am beginning to see that the impact is much greater than I realized. What I need to live now is next to nothing. My monthly expenses have dropped down to $900 a month (food: $250, gas: $125, utilities: $75, insurance: $150, cell: $30, clothing: $25, car: $100, entertainment: $100, other: $45. All additional income goes to savings), which is more than Jacob’s monthly expenses, but not by a whole lot and there is a lot of frills built in. I should point out this is what it costs me to live; my income is much higher than this. Putting the money aside, living in the tiny house brings about something more valuable. It brings opportunity and peace of mind. Since I have drastically reduced my monthly expenses, it has opened doors to many things. It has meant that I am able to leave my old 9 to 5 job and become self employed. It means that I don’t have to work a job I didn’t like, I can forget about stuffy suits, I can now work from anywhere. It means that 2014 is going to be the year I live in a foreign country; I’ll take more vacation time, and be able to focus on what is most important to me. It also means that if something were to happen, I could live off of savings for a very long time (measured in years, not months) if I had to. Peace of mind is something that I have begun to realize is very valuable to me. At the ripe old age of 29 I am semi-retired. I still have to do work, but honestly if I had $10 million in the bank, I’d probably still do what I do because I’ve chosen it and I love doing it. Since moving to self employment I have discovered that I could make the same amount of money, but in few hours at work, where I call the shots and with much less stress. It means that I can pay off my student loan early, save more and also begin to explore some of the techniques that Jacob employs in ERE. Q: How big is your house and how can you live so small? A: My house is 150 square feet plus the loft for my bed. While my house isn’t for everyone, you’d be surprised what a well designed space can do for such a small foot print. It also means that I extend my house to the outdoors and my community. I have a great outdoor space with an outdoor kitchen for when the weather is nice. Otherwise I am out at coffee shops, out with friends, at the park, traveling around the world or working out of a co-working space. Q: Where do you put all your stuff? A: The question isn’t where do you put all your stuff, but how can I reduce the amount of things I own, for which I later have to store? By reducing down your possessions to the essentials and a few precious things, fitting it all in a tiny house isn’t that hard. I always tell people to pare down their possessions then design the house around what’s left. I have some things (tools, camping gear, out of season clothing) stored in a tiny enclosed trailer. Honestly I don’t miss stuff, if I did, I’d just go a get a bigger house because I now have that flexibility. Q: Do tiny houses have running water, flushing toilets and lights? A: Sure do! Honestly it is just like a house, but smaller. I specifically selected appliances designed for small spaces (RV’s and Boats). In my house I have a full power system that is grid tied, a standard pluming system with an on demand water heater, and my bathroom can be plumbed just like a normal one, right now I use a composting toilet. Q: I saw tiny houses are often built on trailers, isn’t it just a RV or motor home. A: There are some overlaps, but the main distinctions are a tiny house looks like a traditional home. 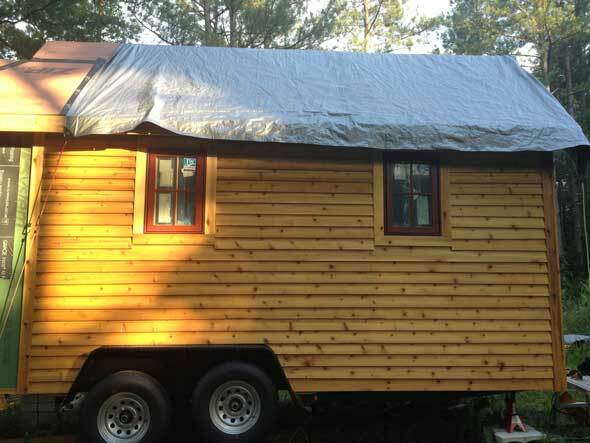 When you look at a tiny house, it says to you a house, not trailer. It also has much higher grade of materials and is built for full time living. RVs are only intended for seasonal use and won’t hold up well if you live in them full time. Most RVs have r-4 insulation which will leave you very cold in the winter months, while my house has r-20. Q: Where can I find out more or see a tiny house in person? A: We blog about tiny houses at our blog TheTinyLife.com . In April 2014 we are having our Tiny House Conference (tinyhouseconference.com), where you can see several tiny houses in person and learn all about them from our amazing speakers! 6 users responded in " Guest post: It started one Friday afternoon, … "
Where do you find land to put it on? Are there any permit issues, especially since you’re on the grid? I like your blog and have enjoyed looking at the tiny houses featured there. I like the IDEA of living in a tiny space, but I’m pretty sure I, personally, could never do it. I’m not a real “stuff” person, but I do have more than the average tiny house could hold!! I live in 1000 SF house that I bought as a foreclosure for only $38K, and I, like you, very much appreciate the positive impact that having cheap housing has had on my finances. I happen to live in an area where taxes are relatively low, and have a big yard for vegetable gardening, etc. I applaud the tiny house lifestyle. But I’d also like to just express that building and living in a tiny home is one way to reduce housing expenses, but there are a lot other ways as well, one of which is buying a house on the cheap in a part of town that may be slightly less desirable. A lot of my “fancy” coworkers turn up their nose about the area of town I live in, but I have great neighbors and am close to everything, and my house, though older and smaller, is of a much higher quality with respect to the craftsmanship, etc. than the suburban tract homes that they live in. Good luck with your tiny house endeavors! @Kevt: In my case I have a lease on some land and instead of paying money for it, I help out the owner every now and then. You can also purchase land that most traditional houses couldn’t use, but fit a tiny house very well; land like that is often pretty cheap. When it comes to permitting and codes being on a trailer helps a lot, check with your local office. @Edith: Thanks for the kind words. Tiny means a lot of different things to different people. The fact that you were conscious about your housing is a huge step. Tiny houses aren’t for everyone and it might not be for me for the rest of my life, but it suits me well now and if I do go bigger I’ll be paying with cash. I garden as well, it makes a big impact on the bottom line and health. Do your zoning and permitting research before building. Pretty much the unmodified blueprint for what I intend to build in 8 years. Mine’ll be a bit bigger in case my mom moves in when she’s 15-25 years older. By then I may build another so who knows yet!